For those of you who grew up either chopping your own wood or buying split wood and storing it for the winter, you can easily recreate the look in your own home without the hassle using the Real Fyre Charred Split Oak Gas Logs by Peterson. Each set of gas logs looks like the charred split oak wood, cured for seasons that you remember. The logs not only look great, but are constructed of the highest-quality materials in the industry and reinforced with steel rods. The burnt look of the logs and the burnt-through bottom log that gives you a view of the flame and embers adds to the authentic look. 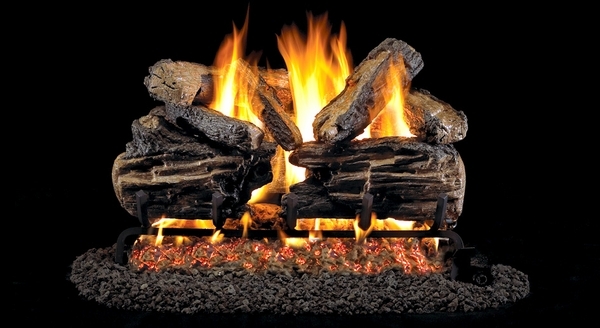 The gas flames dancing realistically through the holes in the top logs provide the finishing touch. You don't need to give up the homey look of split wood and you don't need to break your back trying to fill up the woodpile. All you need is a set of Real Fyre Charred Split Oak Gas Logs by Peterson and you and your family can continue to have your winters the way you like them. I am especially pleased with how you handled a major problem I experienced with my order. Although this gas log set has performed very well and I am pleased with my selection, I do think that the instructions could be written with a little more detail. Especially for those who are attempting to install the set themselves. (If you are planning on getting your set professionally installed, then don't worry about it.) Our first issue came when we discovered that our gas line was on the opposite side of the fireplace from the line on the log set. After finding the solution through some experimentation, we also found it frustrating to try to bend the gas line in such a way that it didn't kink anywhere along its length. As I said before, it is a great product that we would buy again, but it would be helpful with better instructions.